Social selling generates better quality leads, increases pipeline, and boosts win rates and deal sizes. Here’s how to use social selling to your advantage. Social selling is about leveraging social networks to find the right prospects, to build trusted relationships, and ultimately, to help achieve your sales goals by answering prospect questions and offering thoughtful content and insights to match each stage of their buying journey. Through commenting, liking, or sharing content with prospects, salespeople become part of the conversation and boost their own credibility by showing an active interest in what their buyers are posting and talking about. To be effective at social selling at an organization level, everyone needs to be engaged. Like many successful business initiatives, social selling is a team effort. Social Selling may still seem like a buzzword, but the practice work. Instead of jumping into your sales pitch, you are now are spending time interacting, engaging, and building a trust with prospects via social media. Before diving in, make sure you and your team have social media accounts set up, mainly LinkedIn and Twitter. Your social accounts should not just read like a resume or contain lacklustre information. Instead, provide value to your potential buyers in your social profiles and become a trusted advisor in your industry. Once you have your accounts set up to perfection, you need to begin your research. These two guides will ensure you become a social selling expert. After your profiles and research have been done, you’ll need to figure out where your buyers are-generally speaking for B2B sales you need to be on LinkedIn & Twitter, and possibly YouTube. Start sharing! Dedicate 50% of your content to your buyers. The other 50% should be content related to how you want to be known online. If you have no idea what to share, share what your customers are sharing! Build relationships through conversation. Make it a daily routine to initiate five or more new conversations daily to further develop new relationships. Follow up. Check daily for LinkedIn profile views, likes, shares, comments, and InMail messages; as well as Twitter likes, re-tweets, and direct messages. Make sure to respond to all of the above on a daily basis. First, you’ll need social media accounts. Preferably LinkedIn, Twitter, and Facebook (XING if you’re in Europe). 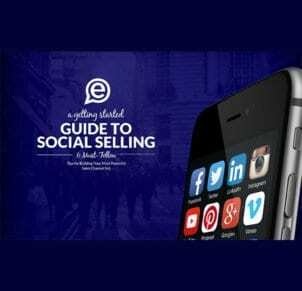 To help your sales team curate content, share that content via social, and measure their metrics via reporting, you might want a social selling platform like EveryoneSocial. To train your team on social selling, you might want to hire a trainer like The Sales Foundry, SalesforLife, or Vengreso. Your marketing presence has to achieve the same outcome of a heartfelt handshake–which can be extremely challenging to do in a digital environment when your sales reps are limited to short emails, sales decks, and automated campaigns. That’s where social selling comes in. 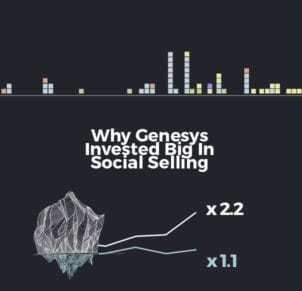 Genesys recognized the value of social selling a few years ago and how it can greatly improve their pipeline, win-rates, and deal size. By deploying a unique strategy along with social selling software, Genesys amplified their won opportunities by 22% and increased their deal size by 165%. Your digital footprint tells the world who you are, what you care about, and the value that you bring to your industry. 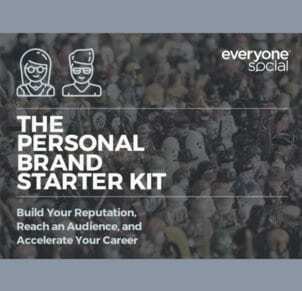 Are you ready to build your reputation, reach an audience, and accelerate your career?